There is no better way to celebrate Independence Day than with an original airline trolley in patriotic livery. 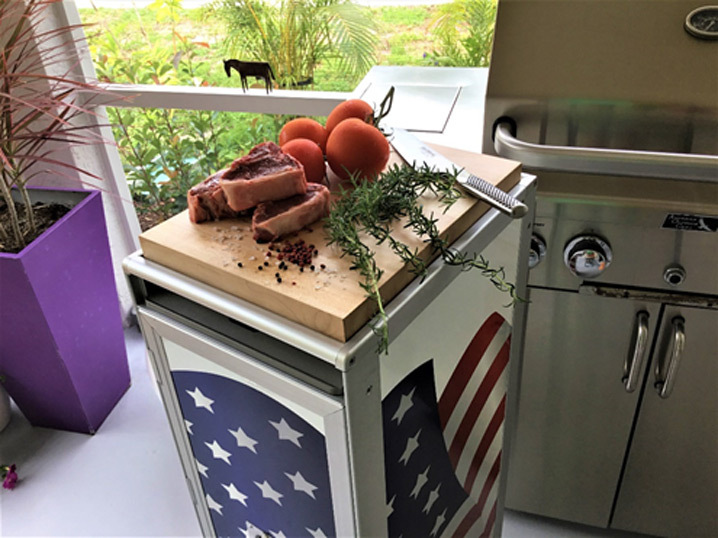 The SkyCart™ – although designed and built as a galley cart for use on commercial airliners – is equally suitable for a party inside as for the traditional barbecue outside. It easily holds all the utensils, the food, the condiments, and whatever else you need in easy reach at your grill. Now there is even a butcher block that can be inserted between the rails on the top. It fits perfectly with almost no play and comes in very handy for last minute seasoning and cutting before your holiday feast gets grilled. This is an authentic airline service cart which combines the aviation theme with a unique patriotic display. It is brand new, sourced from an assembly line where airline equipment is manufactured. This one has never seen the inside of an airplane, it is clean and has no dents or other signs of wear and tear. Nevertheless, it is the real thing. Your guests will notice, and it will be the talk of the day. MySky Aircraft has a few ready to ship. As a 4th of July Special they come with the additional butcher block at no extra cost. The special deal also includes a Poly Drawer and an Aluminum shelf. It is ready for the party. Call MySky Aircraft now at 800. 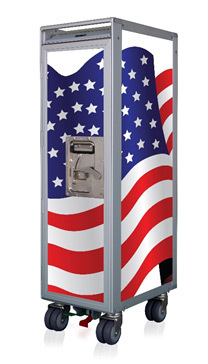 680.5173 to reserve your “4th of July” SkyCart™ or send an email to info@myskycart.com.